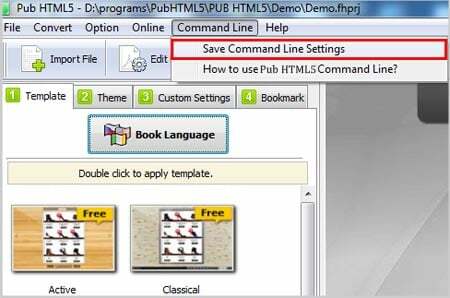 In addition to standard conversion within the program, Pub HTML5 also provides you with a Command Line Tool which enables you to run the conversion in the background. Without opening the software, you can convert a PDF to a digital catalog with a few lines of simple code. It's easy and fast! First, you can save the settings of the digital publication in Pub HTML5 for reference. And after you save the settings, you can run the Command Line Tool with ease. Login with your account, import a PDF and design the digital catalog with the custom settings such as template and theme. Then you can click "Command Line" and in the drop-down list, select "Save Command Line Settings" to save the Template settings for the HTML5 catalog. Next, you will want to open your Windows Command Line box (cmd.exe) and then drag and drop the Pub HTML5 Command Line tool into it. Press "Enter" and the below code will show up. And you can refer to the code and examples and input the code to specify your conversion settings. After you finish the code settings, you can start the silent conversion.